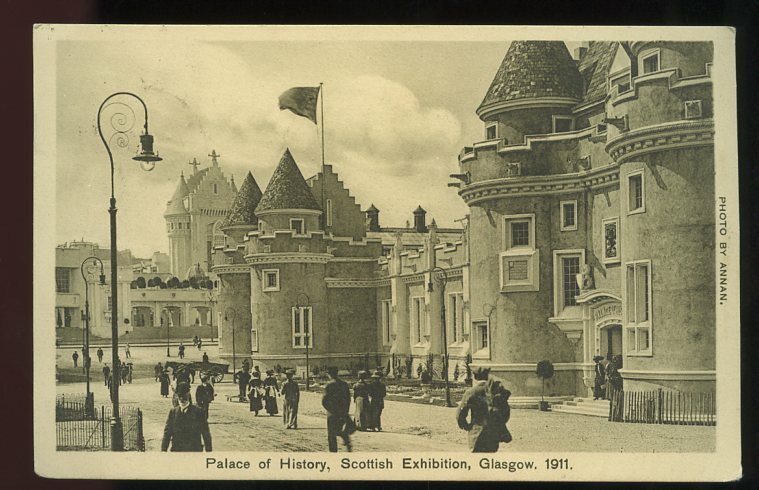 The elucidation of Scottish prehistory has been seriously handicapped by an almost invariable wrecking of prehistoric structures and objects as they come to light (Ludovic McLellan Mann, Palace of History, 1911). It has become a truism to say that prehistoric material culture has a biography that archaeologists and others continue to add chapters to even today once we have found them. And by the standards of your average assemblage, a series of Bronze Age pots found in a 19th century sand quarry just outside Coatbridge, North Lanarkshire, has an extraordinary and complex final chapter, and I suspect that the tale is not yet finished. These pots have become entangled with a whole series of people, places and events in the 161 years since their discovery. The modern story of these pots includes a stately home, an industrial heritage museum, a Carnegie library and the Scottish Exhibition of 1911, with a surprising connection to the Sighthill stone circle thrown in for good measure; and these were pots that came to the attention of one of the first lecturers in prehistory at the University of Glasgow as well as, of course, Ludovic McLellan Mann. This remarkable journey is only part of the story, because 4000 years before these pots were plucked from a bizarre cemetery by quarrymen, they were laid in the ground with great ceremony, grave gifts and even containers for the dead. This cemetery may have lain hidden for ever if not for the Industrial Age’s desire for resources but once found, this assemblage would quickly fragment and disappear. This post was inspired by finding some of these pots in a very surprising location. On a recent visit to the Summerlee Museum of Scottish Industrial Life, Coatbridge, I encountered probably the most explicitly urban prehistorical museum display I have ever seen. 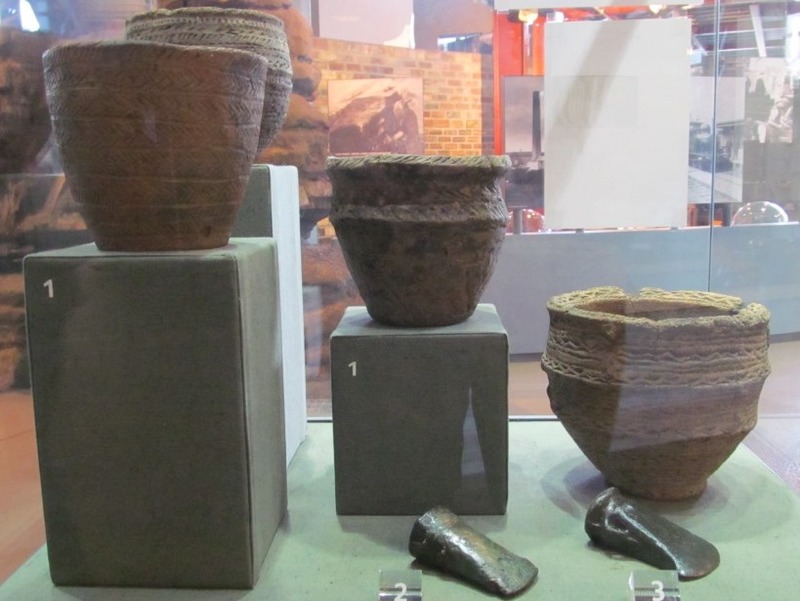 A grey-based museum display case, with four Bronze Age Food Vessels on pedestals (as well as a couple of random bronze axes) was a surprising discovery in a museum that celebrates North Lanarkshire’s amazing industrial heritage. The Food Vessels were filled with scraps of bones. But even more surprising was a big picture above the display that showed the location of where these pottery vessels were found. Because this is what the findspot looked like in 2008. 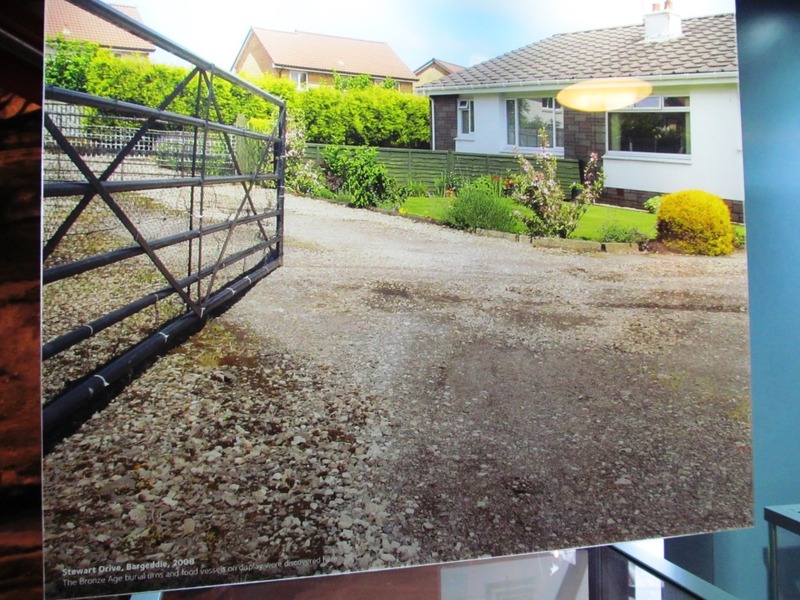 It says so on the photo: ‘The bronze age burial urns and Food Vessels on display were discovered here’, written beneath the picture of a detached house and garden in Stewart Avenue in Bargeddie. Food Vessels. Excavated in 1852 from the Bronze Age burial site near Drumpellier. 11 stone coffins were found, each containing fragments of human bone and a ceramic pot containing a brown dust residue. Approximately 4000 years old. This begs more questions than it answers. How did the four Food Vessels get here? Was the bone (which did not look cremated) in the pots genuine? What on earth was that brown dust? And what does all of this have to do with a modern house and street? Perhaps it as simple as this: the pots were literally found in the location beneath this house, and so are now displayed metaphorically beneath it. To make sense of this discovery we have to go back to the (modern) beginning, to the moment of discovery. Thankfully we have a fairly full description recorded by Andrew Miller in his book The rise and progress of Coatbridge and surrounding neighbourhood (1864), published just twelve years after the discovery was made. Miller recounts a typical discovery of the time (and I have previously blogged on similar discoveries at Ferniegair and Townhead): during sand quarrying in Spring 1852, under the orders of a Colonel Buchanan, some men ‘came upon a stone coffin. After a few days they came upon another, and another, until they numbered eleven’. This series of shocking revelations must have held up the quarrying to some extent, but not before some kind of attempt was made to record the arrangement of the burials and their contents, although by whom is not clear. The cists were laid inside a deep circular depression, perhaps a subterranean burial place that was once covered by a mound. Miller notes that within this circular trench, nine of the bodies had been laid to rest in ‘coffins mathematically arranged’ (although the size of these cists is never stated). 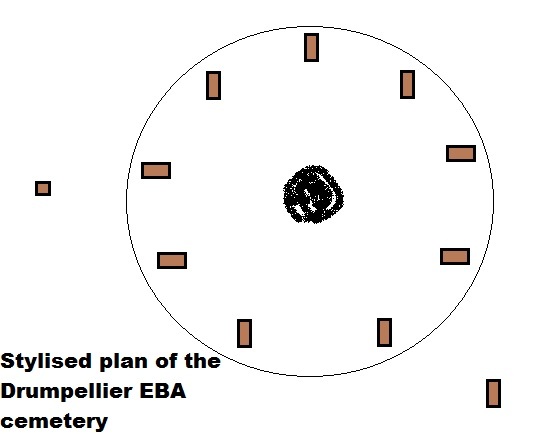 Two further ‘satellite’ burials were also found nearby, as well as some urns containing cremated bone, suggesting multiple phases of burial activity associated with different forms of mortuary rites. The cists mostly all contained one pot at the ‘head end’ of the burial, some scattered human bones, and ‘a little brown dust’ in some urns (maybe human remnants or some kind of organic residue related to what the pots contained when they were laid in the graves). Within the centre of this very strange circular arrangement were found ‘two barrowloads of charred bones’. Human bone identified at the time was thought to be from adult males only, reflecting the demographic of the men who found the burials in the quarry. What happened to these pots next, a fine assemblage of Food Vessels and much larger cinerary urns? The quarrymen, according to Miller, took some of the pots to nearby Drumpellier House – it seems likely that these were some of the ‘urns’ identified by Miller (rather than the smaller Food Vessels now at Summerlee). What happened to these urns is unknown. JM Davidson wrote, in a short piece about another Bronze Age cist found nearby in 1961, that he had contacted the (un-named) widow of Lt Col Arthur Buchanan a few decades previously asking about these urns. ‘She informed me that while at Drumpellier she had often tried to locate these vessels but without success.’ Drumpellier House was owned by the Buchanan family, with the estate and house funded from a tobacco merchant fortune acquired in the 18th century. Thus was the assemblage fragmented and distributed, probably between landowners and wealthy men who were able to, should they wish, admire the crude pots while enjoying an after dinner cigar and brandy, and in the end break or lose them at their leisure. Yet at least some of the pots from the Drumpellier discovery found their way into the public domain, through exhibitions and local education establishments as we shall see. The only modern archaeological account of the excavation and the pottery was written by the late Alex Morrison of Glasgow University, and published in the Glasgow Archaeological Journal in 1971. 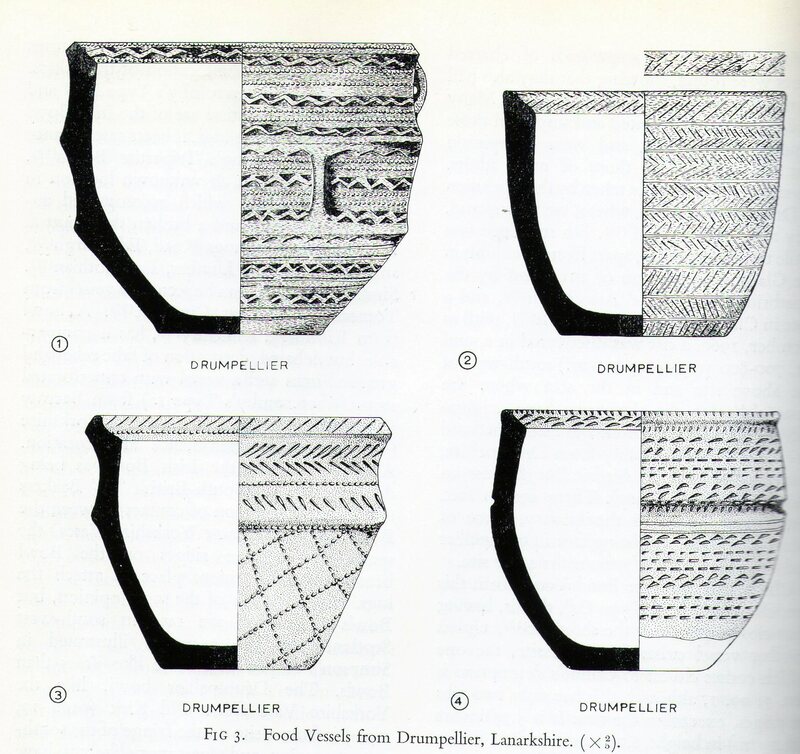 Four Food Vessels from Drumpellier were described in a good deal of detail by Alex (the four on display at Summerlee and illustrated above), who at that time was one of the leading expert in Bronze Age burials in Scotland, and this publication was typical of his tireless rounding up of miscellaneous discoveries, both recent and very old. Thus his Drumpellier account (reproducing much of Miller’s description of events) was published alongside accounts of Food Vessel burials from Ayrshire and Dunbartonshire. Morrison put the Vessels into a (then) contemporary context, assessing parallels for the cemetery and pots, and also documented some more details of the journey this part of the pottery assemblage had been on. It seems that one or more of the pots from the sand quarry ended up in the care of a now forgotten society, the Coatbridge Naturalists Association. This organisation allowed one of the Food Vessels to be displayed at the Scottish Exhibition of 1911. This remarkable exhibition ran between 2nd May and 4th November and was based largely in Glasgow’s Kelvingrove Park and surrounds. The vessel was displayed in the Palace of History, a grandiose and temporary structure in the park. The Prehistoric Gallery was curated by Ludovic McLellan Mann. The gallery was packed full of things, some from Mann’s own private collection, others loaned from museums, galleries and private collections. This was, according to Graham Ritchie, the outcome of two years of work by Mann, and this shows in the amazing variety of stuff packed into a relatively small space. The walls were adorned with 16 large wall charts, documenting the prehistory of Scotland back into the depths of geological time. As well as hundreds of objects, there were displays that were basically the ‘restoration of sites with their own soil and relics’, as well as reconstructions and scale models. The central feature of the gallery was the ‘life-sized statue of a typical man of the late Stone Age’ sculpted by Alexander Proudfoot. 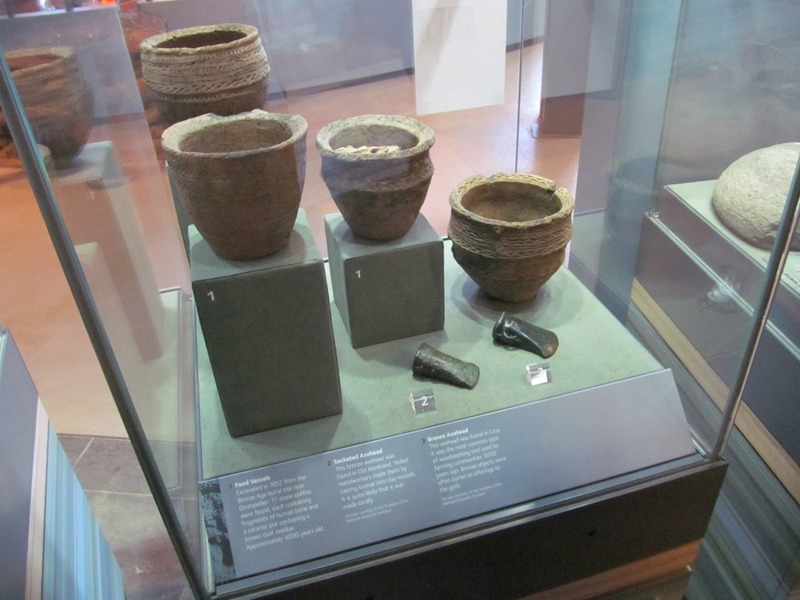 This glass case was dominated by Bronze Age pottery, containing five Beakers, eleven Food Vessels and six urns, as well as two ‘bucket-shaped vessels’ and twelve ‘craggans’ or ‘pottery churns’. A text by Mann on prehistoric pottery chronology accompanied this display. Quite what happened next is unknown, but at some point after this, four Food Vessels from Drumpellier turned up in Airdrie Burgh Museum, which was, I think, actually a room in Airdrie Public Library. (Airdrie is a town adjacent to Coatbridge.) 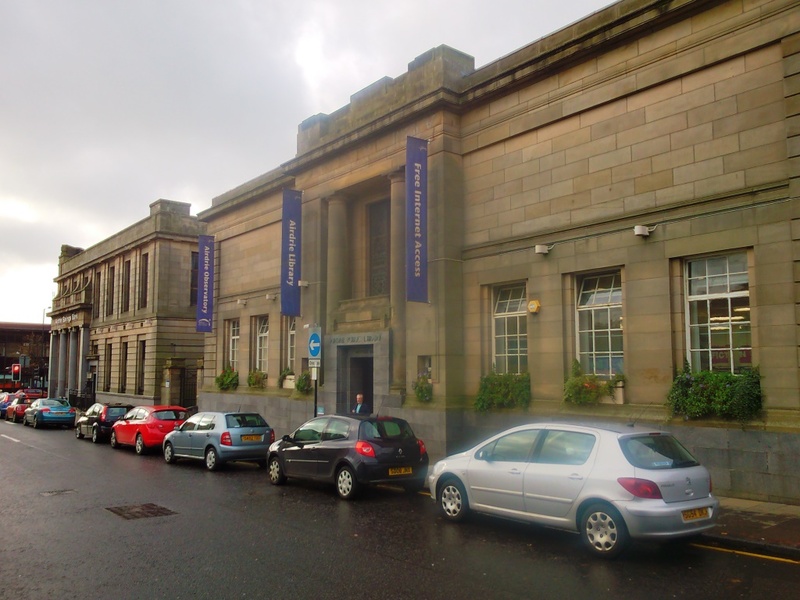 This library was opened in 1925, as the older Carnegie funded library was getting too small. (I have no idea if the pots were also kept in the old library.) The chronology of these pots and their association with this library are unclear. In 1961, JM Davidson noted that one Food Vessel was located in Airdrie Burgh Museum. Alex Morrison, writing a decade later, notes the presence of four Food Vessels from Drumpellier on display in Airdrie Library. The Royal Commission on Ancient and Historic Monuments of Scotland (RCAHMS) confirmed this later in the 1970s when they published a small note on the site (NMRS number NS76SW 3) in their Lanarkshire Inventory (1978). Quite why these pots ended up in a library in Airdrie is unclear, as is when they ended up in Summerlee (for it is the same four vessels), but at least unlike the urns that were spirited away, one or all four of these have been on public display for over a century. Airdrie Public Library has another, more noteworthy claim to fame. It hosts the Airdrie Public Observatory, open to the public, and managed by the Airdrie Astronomical Association. 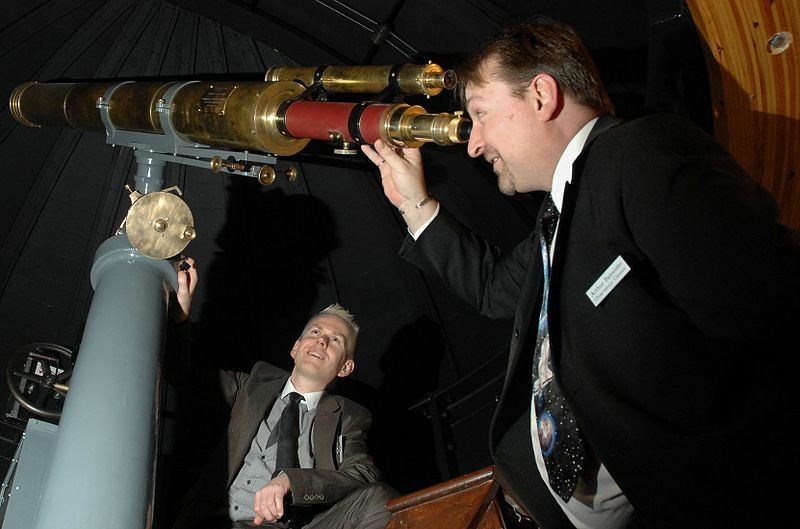 This amazing resource has a very fancy telescope installed in the rooftop observatory and the AAA hold weekly meetings and host talks and lectures throughout the year. Before AAA took over management of the observatory, it was run by ASTRA (the rather ungrammatically named Association in Scotland To Research into Astronautics). Both organisations have rather fine logos. This organization saved the observatory from closure in 1978, and one of the leading forces in saving the observatory was one Duncan Lunan, the brains behind the Sighthill stone circle. Lunan has described ASTRA as ‘Scotland’s national spaceflight society’ which makes it sound more amazing than perhaps it is / was. And Lunan was ‘curator of Airdrie Public Observatory off and on for 18½ years between 1980 and 2008’. There are of course similarities between this endeavour and the stone circle: both were part of projects with the aim to make astronomy more accessible to the public, although the observatory probably does this more effectively than the stone circle. But while the observatory can still be found at the Library, the Food Vessels are gone. 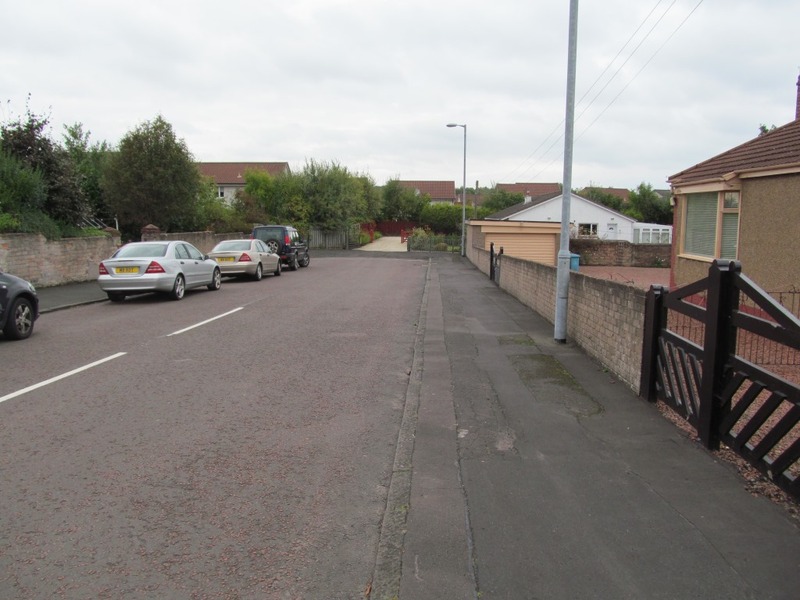 I have been unable to find out when the Food Vessels found their way from Airdrie back to Coatbridge – and Summerlee – which is much closer to where they were found back in 1852. Summerlee was closed for a while, but reopened in 2008 with a very fancy revamp, and this might be when the pottery found its way into the museum (along with some other local archaeological discoveries) as I have no memory of these objects being on display when I last visited in the late 1990s. Archaeology is given pride of place now at Summerlee, with (overgrown) excavations at the iron works visible from a viewing platform, and of course it is not surprising that the Bronze Age cemetery came to light because of industrial activity. The final element of this journey is for me to write myself into the biography of these pots, which I am doing by writing this post. After my visit to Summerlee, I knew that I would have to visit the location shown in their display, Stewart Avenue in Bargeddie. Indeed, I could not resist, and within a few days, I was parked on this short cul-de-sac, reading Alex Morrison’s GAJ article propped up against the steering wheel. The location where the circular cist cemetery and the Food Vessels were found is entirely mundane and ‘normal’, suburbia, bungaloid. Very quickly, once I had left the car and was wandering about with my camera, I was aware of twitching curtains and being under observation. (This is actually a common phenomenon when doing urban prehistory fieldwork.) After establishing the lie of the land, I returned to my car, and soon a guy was walking up towards me from the house to my left. He clearly wanted to speak to me, as he lurked beside my door in a slightly awkward manner, perhaps sent from the house to confront me; I delayed opening the door for a bit too long for both of our comfort, and then engaged with him. He asked me: were you taking photos? Yes I said. Why? he asked. Then came my bizarre explanation: I am an archaeologist. A Bronze Age cemetery was found here in the 19th century. I am writing a blog about prehistoric sites in urban locations. This elicited a surprising response. Ahhhhhhhhhh. I remember someone telling us about that once. It was in our garden! I re-assured him nothing was left now, no bodies under the patio. He told me that years ago someone had given him a ‘folder’ of information about the cemetery. He told me that his reaction to being given the news of the cemetery, and the folder, was: so what? And shrugging his shoulders, he was on his way, leaving me alone with my GAJ and my camera and my bizarre explanation. One thing I had not expected was apathy, disinterest, a lack of concern for something that seems to me pretty amazing, or at least a little bit significant. That this is a place that was once a cemetery, then once a quarry on estate lands, and has been gradually immersed in urbanisation ever since the burials were discovered seems to matter, but maybe not to many people. And so the mystery of this weird cemetery and what happened to most of the pots continues; despite increasing urbanisation in this area in the last twenty years, archaeological evaluations in advance of house building have revealed nothing else to add to the story. All we have left now are the pots, four Food Vessels, some human remains that may or may not be genuine (were these bones also in display in the library?) and the brown dust. Everything else is gone. In the early Bronze Age, many pots were brought to this cemetery to be placed with the dead; once they were dug up again, the pots were dispersed once again into the wider landscape, probably never to be reunited again. Sources: various sources were very helpful in making sense in the story of this cemetery and its pots. 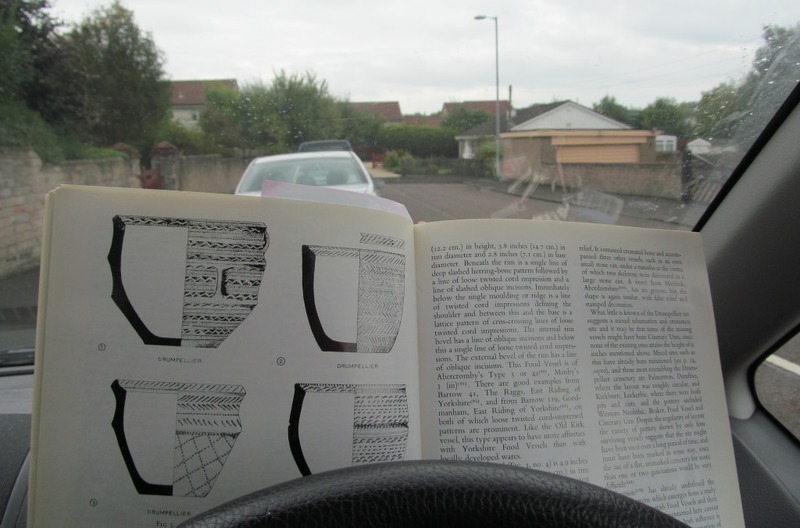 Alex Morrison’s 1971 article was invaluable (Cist burials and food vessels – some recent discoveries and rediscoveries in western Scotland, Glasgow Arch Journal 2, pg 8 onwards). This was the source of the FV drawings. I also got titbits from JM Davidson’s short note in Discovery and Excavation Scotland 1961, 38-39, and RCAHMS South Lanarkshire inventory (1978, page 72). 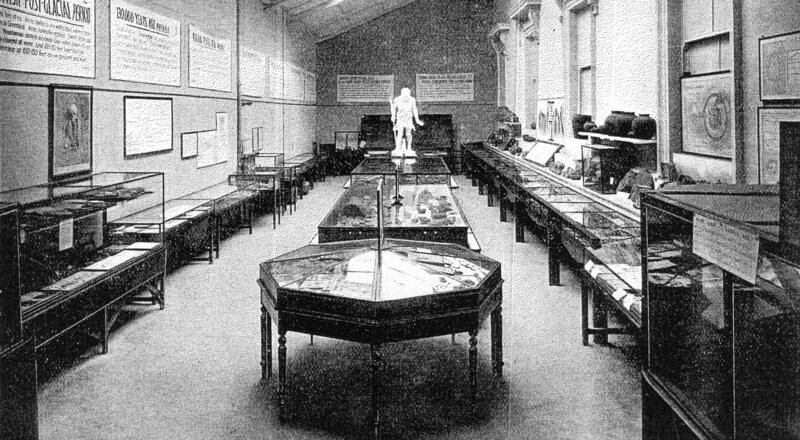 Information on the Glasgow Exhibition came from Graham Ritchie’s biographical paper about Ludovic Mann published in the Proceedings of the Society of Antiquaries of Scotland volume 132 (2002), pages 43-64, and Mann’s contribution to the amazing two volume ‘catalogue’ Palace of History (1911). 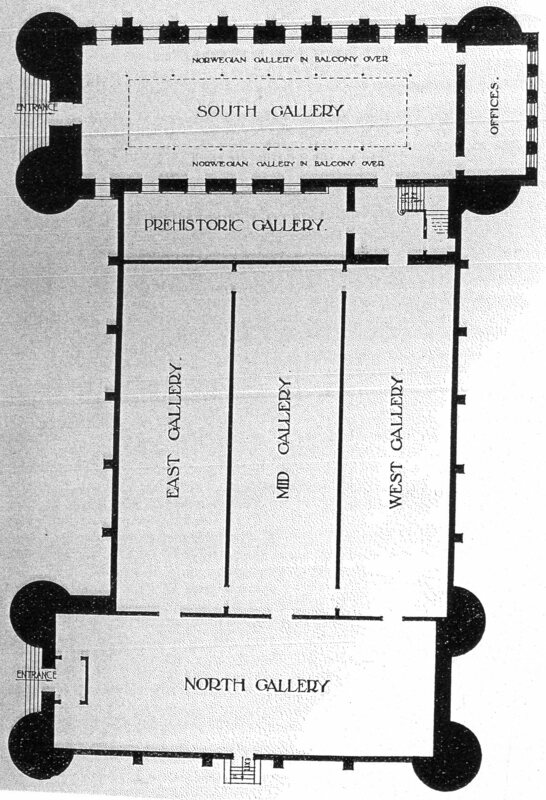 The latter was the source of the plan of the galleries, and the photo of the prehistoric gallery, both scans of photocopies, hence the poor quality. The postcard of the Palace of History is one of many such images available online. The ASTRA logo came from a google search; I could not find a current web page for this organisation; Duncan Lunan information from Duncan’s website (link in post) and the photo of the Airdrie observatory is a Wikipedia Commons image. The AAA logo came from their website (link in post). 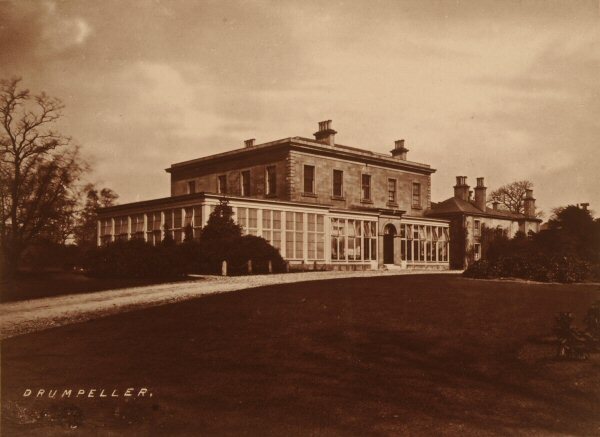 The photo of Drumpellier House was taken in 1870 by Thomas Annan and may have been used as a postcard; various versions are available online. I was accompanied on my visit to Summerlee by Jan, Meli and the esteemed Dr Steve Mills. 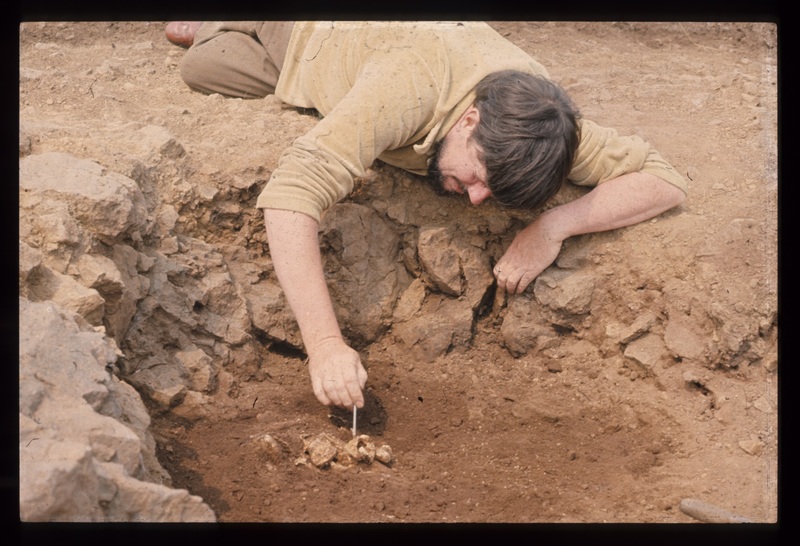 I hope Alex Morrison would have enjoyed this post, he was a great help and support to me early in my career, and he is very much missed; the photo in this post shows him at his funky best digging at Houston South Mound. Literally, a lovely touch and made me laugh! Hi Ian, always a pleasure to make you laugh, thanks for the kind comment.